Spotlight won an Oscar for its portrayal of the Boston Globe’s investigation into institutional silence over child abuse, including some old school data journalism by Matt Carroll. But it’s far from the only example of data journalism shaping policy: Anna Noble asked members of the NICAR-L computer assisted reporting forum for five of their own examples (first published here). This entry was posted in online journalism and tagged Adrian Walker, Cheryl Phillips, Color of Money, heather brooke, Independent Parliamentary Standards Authority, Maggie Mulvihill, mps expenses, State Integrity project, Steve Doig, Telegraph on March 21, 2016 by Paul Bradshaw. 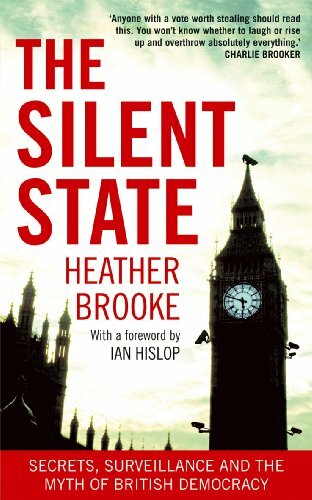 In the week that a general election is called, Heather Brooke’s latest book couldn’t have been better timed. The Silent State is a staggeringly ambitious piece of work that pierces through the fog of the UK’s bureaucracies of power to show how they work, what is being hidden, and the inconsistencies underlying the way public money is spent. Like her previous book, Your Right To Know, Brooke structures the book into chapters looking at different parts of the power system in the UK – making it a particularly usable reference work when you want to get your head around a particular aspect of our political systems. Chapter 1 lists the various databases that have been created to maintain information on citizens – paying particular focus to the little-publicised rack of databases holding subjective data on children. The story of how an old unpopular policy was rebranded to ride into existence on the back of the Victoria Climbie bandwagon is particularly illustrative of government’s hunger for data for data’s sake. Picking up that thread further, Chapter 2 explores how much public money is spent on PR and how public servants are increasingly prevented from speaking directly to the media. It’s this trend which made The Times’ outing of police blogger Nightjack particularly loathsome and why we need to ensure we fight hard to protect those who provide an insight into their work on the ground. Chapter 3 looks at how the misuse of statistics led to the independence of the head of the Office of National Statistics – but not the staff that he manages – and how the statistics given to the media can differ quite significantly to those provided when requested by a Select Committee (the lesson being that these can be useful sources to check). It’s a key chapter for anyone interested in the future of public data and data journalism. Bureaucracy itself is the subject of the fourth chapter. Most of this is a plea for good bureaucracy and the end of unnamed sources, but there is still space for illustrative and useful anecdotes about acquiring information from the Ministry of Defence. And in Chapter 5 we get a potted history of MySociety’s struggle to make politicians accountable for their votes, and an overview of how data gathered with public money – from The Royal Mail’s postcodes to Ordnance Survey – is sold back to the public at a monopolistic premium. The justice system and the police are scrutinised in the 6th and 7th chapters – from the twisted logic that decreed audio recordings are more unreliable than written records to the criminalisation of complaint. Then finally we end with a personal story in Chapter 8: a reflection on the MPs’ expenses saga that Brooke is best known for. You can understand the publishers – and indeed, many readers – wanting to read the story first-hand, but it’s also the least informative of all the chapters for journalists (which is a credit to all that Brooke has achieved on that front in wider society). With a final ‘manifesto’ section Brooke summarises the main demands running across the book and leaves you ready to storm every institution in this country demanding change. It’s an experience reminiscent of finishing Franz Kafka’s The Trial – we have just been taken on a tour through the faceless, logic-deprived halls of power. And it’s a disconcerting, disorientating feeling. But this is not fiction. It is great journalism. And the victims caught in expensive paper trails and logical dead ends are real people. Because although the book is designed to be dipped in as a reference work, it is also written as an eminently readable page-turner – indeed, the page-turning gets faster as the reader gets angrier. Throughout, Brooke illustrates her findings with anecdotes that not only put a human face on the victims of bureaucracy, but also pass on the valuable experience of those who have managed to get results. For that reason, the book is not a pessimistic or sensationalist piece of writing. There is hope – and the likes of Brooke, and MySociety, and others in this book are testament to the fact that this can be changed. The Silent State is journalism 2.0 at its best – not just exposing injustice and waste, but providing a platform for others to hold power to account. It’s not content for content’s sake, but a tool. I strongly recommend not just buying it – but using it. Because there’s some serious work to be done. This entry was posted in online journalism and tagged book, foi, heather brooke, ministry of justice, mps expenses, MySociety, police, pr, review, statistics, the silent state on April 8, 2010 by Paul Bradshaw.